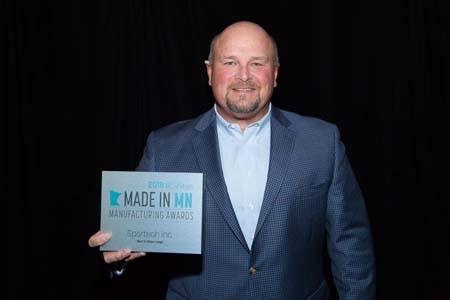 Elk River, Minn. Oct. 3, 2018 – Minnesota is home to more than 8,000 manufacturers, and this past September, Sportech Incorporated was recognized as one of the best in the state by Minnesota Business magazine. Sportech was named Best-in-Class Large Manufacturer during the magazine’s 2018 Made in Minnesota Manufacturing Awards. The annual competition recognizes manufacturing excellence, and winners are selected by an elite panel of judges representing a broad spectrum of businesses in Minnesota. Sportech received the top accolade while being considered with runners-up Bedford Industries of Worthington and Polaris Industries of Medina. The panel of judges noted Sportech stood out for its entrepreneurial spirit and success; job creation and development; and for being an integral part of its hometown community. Last year Sportech experienced revenue growth in excess of 25% and generated more than $200 million of revenue for its clients. Minnesota Business magazine also called particular attention to Sportech’s emphasis on community and employee growth. Last year Sportech voluntarily raised its minimum wage to $15 per hour and has been working tirelessly to attract and retain quality employees by always putting people first and creating a positive culture with exceptional benefits. The meteoric rise and growth of Sportech shows little sign of slowing down. The company’s 2018 financial projections have them on pace for a 40% increase in revenue over last year, and they’ve hired more than 50 full-time employees through the first half of 2018. You can learn more about the Made in Minnesota Manufacturing Awards and read the entire article at 2018 MBM Awards. To learn more about the Sportech culture, watch this videoTo learn more about career opportunities and to apply online visit sportechinc’s website.